MAMEM’s overarching goal is to integrate people with disabilities back into society by endowing them with the critical skill of managing and authoring multimedia content using novel and more natural interface channels. These channels will be controlled by eye-movements and mental commands, significantly increasing the potential for communication and exchange in leisure (e.g. social networks) and non-leisure context (e.g. workplace). 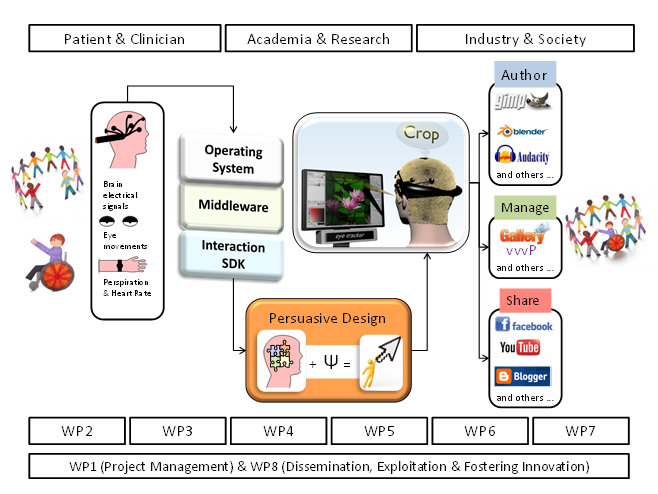 It’s cardinal objective is to facilitate the development of brain-computer interfaces that will lie between the disabled and the conventional interface of a software application dealing with multimedia content. These interfaces will be operated with an eye tracker, an Electroencephalography (EEG) recorder and additional bio-sensors (e.g., heart rate, galvanic skin response).